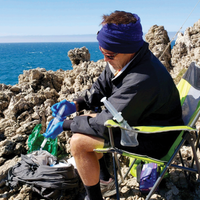 The Smithsonian National Museum of Natural History paleobiologist also studies the evolution of echolocation and special sensory structures in modern whales. 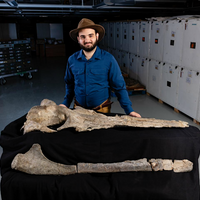 In 2003, Pyenson, now a paleobiologist and curator of fossil marine mammals at the Smithsonian’s National Museum of Natural History in Washington, D.C., headed to the University of California, Berkeley, where he started his graduate work studying the evolution of whales. Stanford zoologist Jeremy Goldbogen, then a master’s student at the Scripps Institution of Oceanography, remembers a conversation the two had about how large whales feed. “Nick . 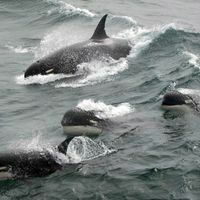 . . brings a lot of knowledge about how living whales work to understand what life was like in the [ancient] oceans,” Goldbogen says. 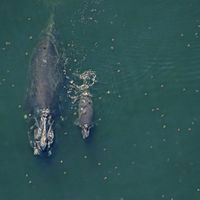 In June, Pyenson published Spying on Whales: The Past, Present, and Future of Earth’s Most Awesome Creatures, which describes how whales evolved from relatively small land-based creatures to the largest organisms that ever lived on Earth. Science, Pyenson says, is all about “telling stories, telling true narratives about the world.” It takes creativity, he says, along with a bit of detective work.